An ice dam is a ridge of ice that forms at the edge of a roof and prevents melting snow (water) from draining off the roof. The water that backs up behind the dam can leak into a home and cause damage to walls, ceilings, insulation, and other areas. 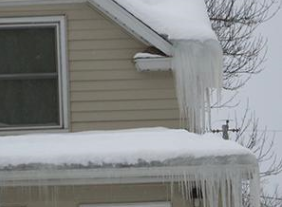 Ice dam removal is one of the keys to preventing leaks in your home. Ice dam formation is the result of a complex series of factors between heat loss from a roof, snow coverage, and outside temperatures. 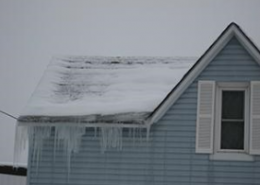 In order for an ice dam to form on a roof, there must be snow on the roof and the upper roof needs to be warmer (above 32ºF) than the lower part of the roof (below 32ºF). 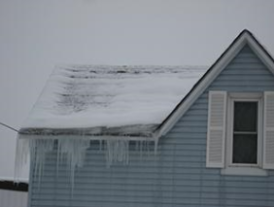 Once these conditions are met ice dams may begin to form and the potential for damage to your roof and home becomes more likely. The snow on a roof surface that is above 32°F will melt. 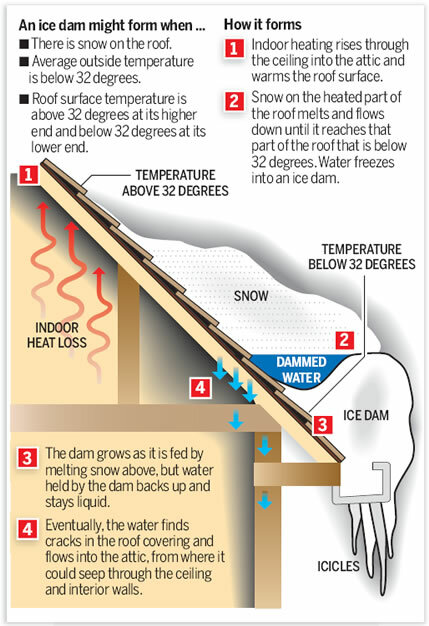 As water flows down the roof it reaches the portion of the roof that is below 32°F and freezes. Now you have an ice dam. Contact us to get started on removing an ice dam- or to assess your home for risk of ice dam formations.